Well. we're almost at the end of 2015 and, as ever, I've been looking over my collection and I've been thinking about where to go next with my tabletop gaming hobby. 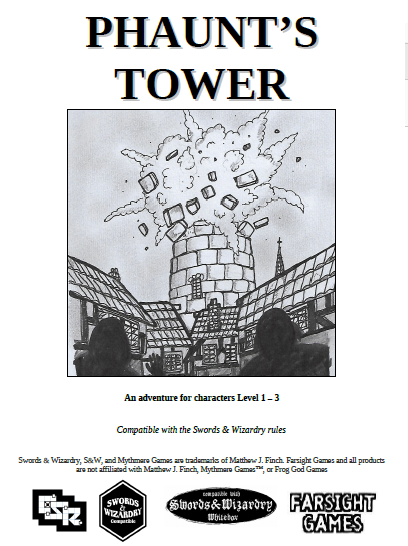 My gaming group will once again convene in the New Year, and at this time we're looking at D&D 5th Edition. It's a great game, probably the best iteration of D&D I've ever played, and it's something to look forward to. I'm not sure what adventure we'll be doing and it's doubtful that I'll be DMing the game, so that's something to look forward to. Saying that, I also have the option of mixing with other groups and gamers I've come into contact with over the last few weeks. This includes a possible DM role for D&D 5th, and another player eager to run a Fantasy Flight Games Star Wars RPG, set in the new era of the Resistance, a la Episode VII. That sounds great, and I'm sure there are members of my existing group who'd be more than up for that. As I was writing this short blog post I received a message that reminded of a game I've not played in a long time, and a game that I love for both the system and the setting - Dragon Warriors. 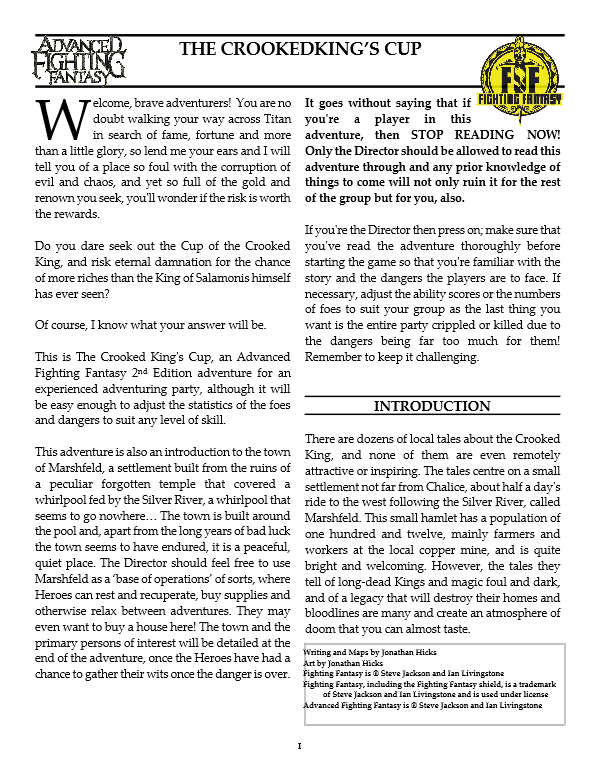 I'd love to GM a game again, even if it's just a short adventure over a month or so, and the thought of gaming in the Lands of Legend is too much to resist. I think I'll make Dragon Warriors my priority in the new gaming year. The thing is, there's plenty of other games we have in our group that we've discussed. There's Shadowrun, a game we played in 2014 and had a huge amount of fun with. Then there's Hulks & Horrors, the D&D sci-fi game that we were eager to return to. Then there's Call of Cthulhu that I've wanted to run for a while, especially the Dark Ages version, and of course I'd love to continue my Warhammer FRP 1st Edition game I began back in early 2015. So, right away you can see the problem. There are plenty of games I want to run and yet there are only so many gamers, and each of those gamers (in my primary group, at least) all have games of their own they want to run. I'm also a family man these days, with a full-time job and a dog and everything, so I don't have the buckets of time I used to have. So with little time and lots of games, how do I divide my time and get them all in? Well, the simple answer is - I don't. I'll have to choose which games I want to run and stick with my choices, and drop the ones that I'd like to play but don't have the 100% commitment that a gaming group would require. If I'm going to game I need to make sure that I'm committed, or the group as a whole will suffer if I'm sat at the table wanting to be somewhere else. There's no point in shooting lasers at alien nasties if I'd rather be crossing blades with orc meanies. That's no fun for me or the rest of the group, especially the person running the game. I'll see what the New Year brings me once we're pasty midnight tonight, but if I had to choose a game right now I'd choose Dragon Warriors. I'm in a pseudo-historical mood right now, and I've had ideas regarding ancient ruins beneath the mead-halls of the Thulanders, but I think watching the first three seasons of Vikings back-to-back may have something to do with that. No matter what happens, I'm looking forward to gaming in 2016. We start from scratch in January, with all new campaigns to start and fresh adventures to be had, so here's to a new year of gaming. I raise my mead-filled drinking horn to you all. And yes, I have a drinking horn and I have mead. 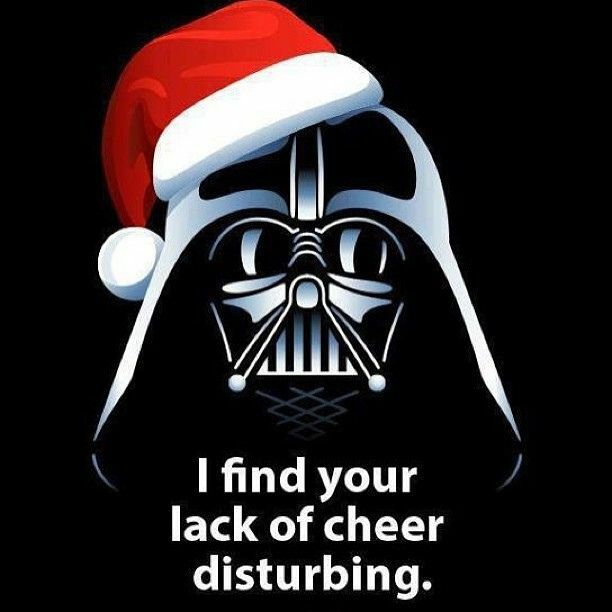 Every year on Christmas Eve, the company department my wife Lisa works for has a morning of team-building exercises. This can take the form of crafts, boardgames, or anything else that takes their fancy, anything that makes them work together. This year, Lisa convinced them to play D&D. Now, these guys have virtually no experience with the tabletop hobby, let alone pen n' paper RPGs, so I was shocked when they really got into certain elements of the game even before I arrived on the scene. Characters had been created with detailed backgrounds, their role in the team had been worked out and they'd even made their own swords and weapons out of cardboard. At first, I had this feeling that it was going to be a bit of a piss-take game, and because they weren't gamers they wouldn't take it seriously. 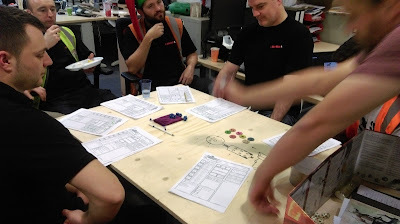 It was the energy from the players more than my abilities as a DM; there was nervous expectation and some trepidation, but once I showed them that they could be as relaxed as I was they settled in to the game quickly. It was great fun and I think some will be doing it again, outside of work. Finally, always listen to your wife when she says 'you should run this game for us'. You never know what you might miss out on. Burroughs’s A Princess of Mars. Bradbury’s The Martian Chronicles. Heinlein’s Red Planet. These and so many more inspired generations of readers with a sense that science fiction’s greatest wonders did not necessarily lie far in the future or light-years across the galaxy but were to be found right now on a nearby world tantalizingly similar to our own—a red planet that burned like an ember in our night sky . . . and in our imaginations. This new anthology of fifteen all-original science fiction stories, edited by George R. R. Martin and Gardner Dozois, celebrates the Golden Age of Science Fiction, an era filled with tales of interplanetary colonization and derring-do. Before the advent of powerful telescopes and space probes, our solar system could be imagined as teeming with strange life-forms and ancient civilizations—by no means always friendly to the dominant species of Earth. And of all the planets orbiting that G-class star we call the Sun, none was so steeped in an aura of romantic decadence, thrilling mystery, and gung-ho adventure as Mars. When I sat down to read Old Mars I was pretty excited. I'd had a great time between the pages of the previous collection Old Venus, and here I was expecting some more of the same. Adventure stories, compelling stories, thoughtful stories; basically, a nice mix of talent and different approaches to the subject matter that would have something for everyone. Mars has always been fascinating, and my love of the red world stems, of course, from classics such as 'The War of the Worlds', 'The Martian Chronicles', and, perhaps strangely, the movie 'Robinson Crusoe on Mars'. It's an amazing world, in real life as well as in the imagination, and when I began reading Burroughs' planetary romances I then found the adventure. Later would come more serious books on the planet, and then actual theories on how we really could travel to the red world and exist there. Now we had rovers there and we were learning more about the nature of Mars every day, the mystery seemed to be fading. This is why this book is so enjoyable. It takes us back to the days when Mars was still an inhabited world we could have adventures in, where races unfathomable were fighting wars unthinkable, and when civilisations we could barely imagine or hope to understand walked the shifting sands. The mix of stories is wonderful and the editors, George RR Martin and Gardner R. Dozois, have made an excellent selection. The tales move from stories about lost civilisations or misunderstood aliens to tales of incredibly imaginative adventure, action and sometimes insane scenarios. One moment you can be contemplating attitudes of the human race towards an indigenous species, and the next you're trading shots with floating ships and screaming enemies. If you want thought and introspection, you've got it. If you want swordplay and blaster fire, you got that too. The stories might sound disparate but they mix really well and, although there might be a point in the book where you don't really want to read about yet another unfathomable Martian civilisation older than Mankind, the stories never get boring and the tales are never too preachy. There's a good mix of approaches to take, opinions to mull over and downright out-and-out fun to be had in this book. So, if you're looking for a Burroughs-esque battles across the sands of Mars, you got it. If you want a Heinlein-inspired trip through the soul of a planet, you got that too. You really do get the best of both worlds. 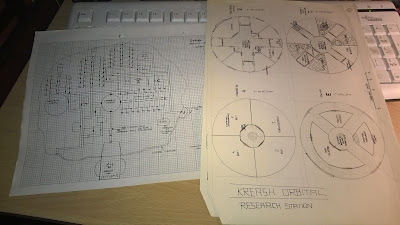 So, for your viewing pleasure, here are some of my first ever game designs for West End Games Star Wars: the Roleplaying Game, from way back in 1987/1988. This one is very first map I drew in 1987, the day after I bought my copy of Star Wars: The Roleplaying Game. 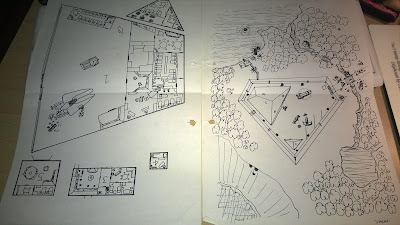 I wanted my own Rebel base, and I created a small one on an idyllic world of boating ponds and woodland walks. It was designed as a retreat, a place where player characters could go to rest and recuperate, pick up missions and generally hang out. These two were created in 1988, and the image on the left is a downed starship being used as an outpost. At first it was controlled by smugglers, but after being outed the Rebels used it as a small strike base deep in the Mid-rim territories. I remember liking to idea of it but don't remember getting much use out of it. 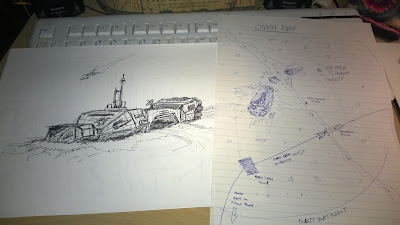 The crash site on the right is a downed Star Destroyer, the impact of the mighty starship hitting the ground devastated the land for miles around, but the crash also bought trade and industry as the locals used it as place of interest and melted parts of the destroyer down to use - they were a pre-industrial race and they needed the metals for their own wars. By this time, the Empire and other scavengers had already taken what they could and left the rest to rot. 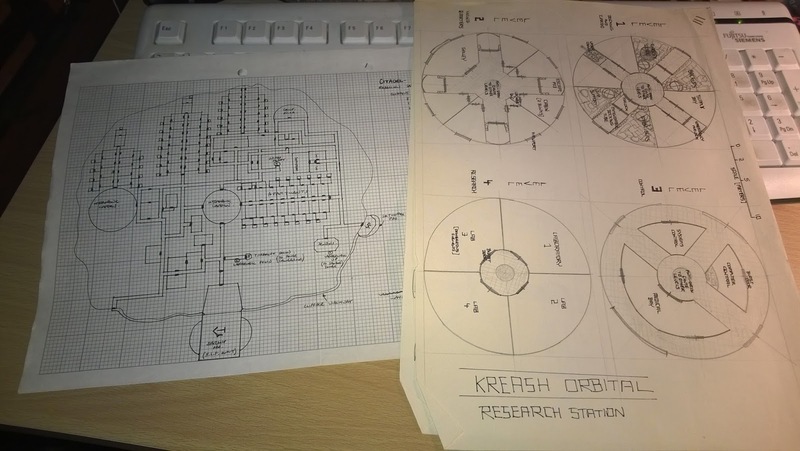 The research station was created for a standard 'trapped on a station with killer aliens' game. You know... Aliens. It is much larger than you can see in the picture, but the game was pretty derivative and didn't really go anywhere. I always liked the design, though. You know, I might use all of these again. The 1980s were a great time to be a tabletop roleplayer. 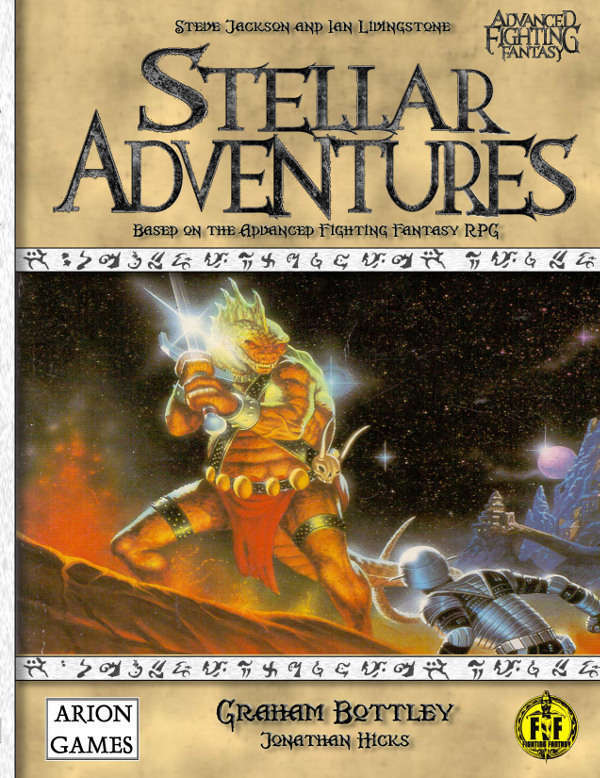 I've been trying not to get into the Star Wars swing of things, but after looking through my old first edition Star Wars RPG game, and thinking about how I create my games now, I've decided to throw myself back to 1987 and create an old-school D6 Star Wars campaign the way I used to do it. On paper, with pens and pencils. This means no sitting at a computer typing, or copying and pasting stats and images off the internet, the things that have made me lazy in my game design in these days of the internet. This means handwriting my plot ideas and situations, stats and character backgrounds, and drawing new places, people and tech. Just the way I did thirty years ago. I'm trying to remember why it is I got into Star Wars, and the Star Wars RPG, in the first place, so I'm starting from scratch. Saying that... who's up for a Star Wars D6 1st Edition game? I've followed this space opera series since the very first volume 'Scars'. I was amazed by that first issue, and then even further amazed by the second volume, 'Ruptures'. The setting was further expanded by 'Nomads', then rattled by 'Ravages', then it was torn apart by 'Justice', and now, with 'Resistance'. the entire galaxy seems to be falling apart. I think the most frustrating thing about this series is the huge gaps between volumes. ; of course, not only do we have to wait for the writer to create and the artist to illustrate, lazy single-language persons like myself then have to wait for the translation. Was it worth the wait? Yes. Yes it was. In fact, I think I'll need to learn another language to help me cut down the waiting time for the next instalment. It's hard to explain what happens in this book for two reasons; one, if you haven't read any of the previous volumes then you'll simply have absolutely no idea what it is I'm talking about. In fact, if you haven't read the first five volumes then please, stop reading this and go and purchase copies of each one right now. Two, if you have read the other volumes in this series then the very last thing I want to do is ruin the surprise for you. You've waited long and hard for this volume and me shouting out about why I was so shocked and amazed by what happens next will only spoil it all. And this is one of those series where you don't want it spoiled for you, I guarantee it. The unfolding of the characters and the setting - as well as the politics and the intrigue - is one of the things that makes Orbital riveting from beginning to end, and then slaps you around the face at the end of each volume when you realise you have to wait months before you can find out what happens next. Sylvain Runberg's writing is always a joy to experience - he has a great talent at worldbuilding and his star-flung setting, as huge and as expansive as it is, is never too big for the characters that he creates. Each individual has a specific and identifiable character, and they always have a depth and quality to them which means that they're never simply 'the bad guys' or the 'good guys'. While there are characters that may come across as a little 'evil', they're never portrayed in a way that's too pantomine, or simple moustache-twirling villains, the same way that the heroes don't have shining teeth and untouchable hair. The two primary characters, Caleb and Mezoke, are as rich and enjoyable as they were from the first volumes and their characters continue to grow and change as the galaxy about them twists and convulses in what could be the end of the... oops. Said too much. I need to stop getting carried away, but that's what the story does. And to accompany great writing you need great art, and once again Serge Pellé has not only knocked it out the park, it's gone out of the city and into orbit. His design and feel is so atmospheric you can almost reach out and touch it; the very alien-ness of the stars beyond Earth makes you wonder if Pellé knows something we don't, and even though the designs are so far out there that they can't be seen by Hubble they still feel tangible and that they belong there, within the reality of the setting that Runberg has created. In fact, it was Pellé's artwork that originally drew me to this series. That first cover, of Caleb and Mezoke posing for the camera with the might of an Orbital towering behind them, caught my eye and upon opening the book I was amazed at the quality, the colour and the design. He hasn't compromised with each volume and has stayed consistent all the way through the story, and to imagine anyone else illustrating these adventures is unthinkable. I'm so high on this series it's difficult to find fault. Yes, I had to go back and re-read some of the dialogue to make sure I had absorbed the facts; there's a lot of exposition in this (and I do not like exposition very much), but it all makes sense and fits together nicely, and brings us back to the events of the opening of volume 1... but that's all I'm going to say about that. A couple of the panels were slightly confusing as I tried to make out what was going on, but in both of these cases it made very little difference to my overall enjoyment of the book. In fact, even mentioning it feels pointless as it didn't change how much I enjoyed experiencing this. And that's what this book is; an experience. You experience the story through the eyes of the heroes, you experience the worlds through the eyes of the different races and the individuals vying for power, and you experience the galaxy as whole when all these things are bought together. Sylvain Runberg has created a space opera setting of action, intrigue and character, and Serge Pellé has given it life and dimension. It's a fantastic thing to behold and I only wish that more people would experience it. I'm a tabletop gamer and when I think of a new science fiction setting to game in, I always think of Orbital first. A board game, a roleplaying game, even other forms of media... hell, I'd love to see Pellé's images animated, that would be a wonderful thing to behold. I can but dream. Orbital 6. Resistance doesn't let up from where volume 5 ended and even ups the ante. I cannot imagine any fan of this series being disappointed with this newest instalment, and even though you will be annoyed at having to wait for another few months to see where this new cliffhanger will take you, I guarantee that the wait will be the only thing you will be annoyed about. Sylvain Runberg and Serge Pellé have done it again - now for the long wait until they do it a seventh time. I'm a great fan of the Witcher setting, especially the books, and my recent foray into Witcher 2 (not great), Witcher 3 (amazing!) and the Witcher boardgame (great fun!) has really got me back into it. I was made aware of the Polish TV show from long ago, 'Wiedzmin', and although the production values are low and it plays fast and loose with the Witcher, it's not a bad show and I found it quite watchable - in fact, I ended up enjoying it. What struck me was the soundtrack by Grzegorz Ciechowski - it's excellent. It took me ages to track down the music and there were four tracks that really stuck out at me, and these were the Dandelion songs, or 'Dandelion’s advices'. They're great songs, though short, and I've always wondered what he was singing about. But I have contacts. ie, I work with a lady called Patrycja who not only isolated the lyris, she translated them for me... and the lyrics were better than I expected. So, here they are, the four advices of Dandelion (Jaskra); Pierwsza rada Jaskra, Druga rada Jaskra, Trzecia rada Jaskra and Czwarta rada Jaskra. The sword will be destined for him. She was not meant for you. it’s a glow above Cintra. the world that will die. still fulfil inside of yourself. so you get the punishment. that wants to be a star on the sky. So what is this fight for ? Gwiazdą w niebie się znaleźć. I po co ta walka. 'The Witcher Adventure Game takes players on a journey across the world of the critically acclaimed Witcher franchise. 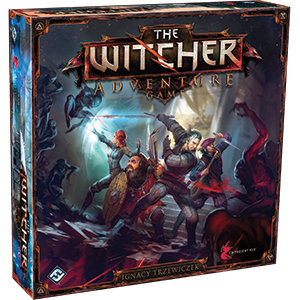 Based on the best selling novels and award-winning video games, the Witcher universe makes its way to your tabletop with The Witcher Adventure Game. You and up to three friends will take on the roles of beloved characters from the Witcher universe and travel across the dangerous wilds, battling monsters, completing quests, earning gold and victory points, and vying for ultimate triumph. Along the way, you’ll craft an unforgettable narrative, unique to each and every game. 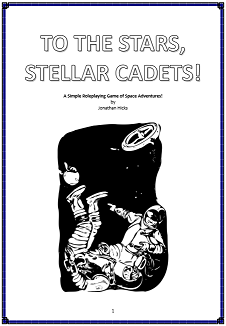 I've learned my lesson regarding Fantasy Flight Games boardgames after my experience with Forbidden Stars. Even though we went on to enjoy that game, I realised that my group had to be better prepared for a complicated game, and even though The Witcher Adventure Game isn't overly complicated I made sure we were ready. One of my gaming group got hold of the game and spent a good couple of hours going through the rules and familiarising himself with the mechanics, so when the four of us came to sit down to play, three of us being new to the game, we were briefed and playing at a good pace within thirty minutes. The game gives you four heroes of the Witcher world to play - Triss Merigold, the sorceress; Dandelion, the bard; Yarpen Zigrin, the dwarven warrior; and,of course, Geralt of Rivia, the Witcher. Each character comes with a detailed figurine to represent them on the board. In fact, the game is up to the usual Fantasy Flight Games standards - good quality packaging, great miniatures, robust cards and counters, and excellent presentation. The game itself is one of quests based around the ideals and thrust of the Witcher stories. You can investigate the goings on around the world and complete quests as you do so, as well as do side quests, and get involved with some rather brutal but simple combat; even though characters cannot die in this game, they get beaten around pretty badly. Players can explore the land and adjust their character as they see fit with development cards, which can be collected as the game progresses to improve dice rolls. Each character also has special skill that helps strengthen them and improve their chances of success, and al these options are controlled by the player as they move across the board. All of these options create diverse and different sagas and stories with every game. 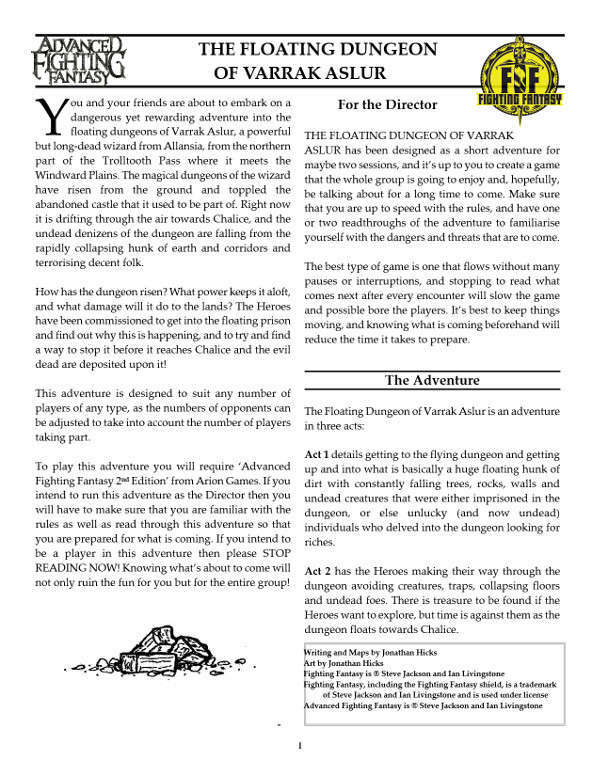 There are a lot of rules to get through so the best thing to do is download the 'Learn to Play' PDF available for free on the Fantasy Flight Games website. The aim of the game is to complete quests and defeat foes, all the while collecting Victory Points. The player with the most Victory Points at the end of the game is the winner. 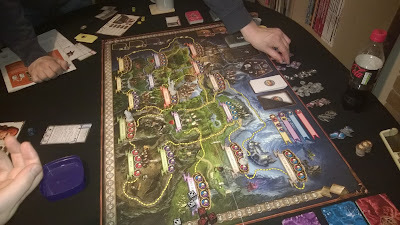 We got into game pretty quickly and after some initial stalls - the use of the development cards was something that was overlooked a few times, resulting in a few depressing combats - we got into the swing of things. The first thing that struck me was that when the question 'who do you want to play?' was asked, everyone paused.... so I dove in and grabbed Geralt. Of course I did. Who wouldn't? It became apparent very quickly that the game was a co-operative one; there is a rule where you can help another player with a quest if they are in the same area as you, and this not only helps the player who's quest it is but benefits the one giving aid even more, resulting in more Victory Points, so it pays to be friendly. Geralt's abilities and dice seemed to be better than everyone else, but it soon became apparent that this didn't matter; I lost more combats then I won and Geralt got a serious battering - which, to be honest, reflected the books quite well. In fact, the quests were pretty grim and even if you succeeded the results were somewhat negative. But across it all we had a great time. the dark, somewhat grim atmosphere of the Witcher world was well represented and you do feel the darkness as well as the bad luck inherent in the setting. Fans of the Witcher will get a lot of fun out of this. It is the longevity of the game that I was concerned about; the quests and side quests are all different but they are all a means to an end - collect resources and Victory Points - but we found ourselves skipping the detail of the cards just to get to the meat of the matter; what were the rewards? When you're fighting to get the most Victory Points, the flavour of the game suddenly becomes superfluous and, as well presented as they are, they become secondary to what you want to accomplish. I don't think that's a flaw in the game, but the details get lost when all you're thinking about is getting those resources and Victory Points. If that's the only thing you play for, then the game may become a little repetitive as you go on and even adding new quests is just adding more detail that may go unappreciated. Perhaps more characters to play might give the game more life as time goes on. 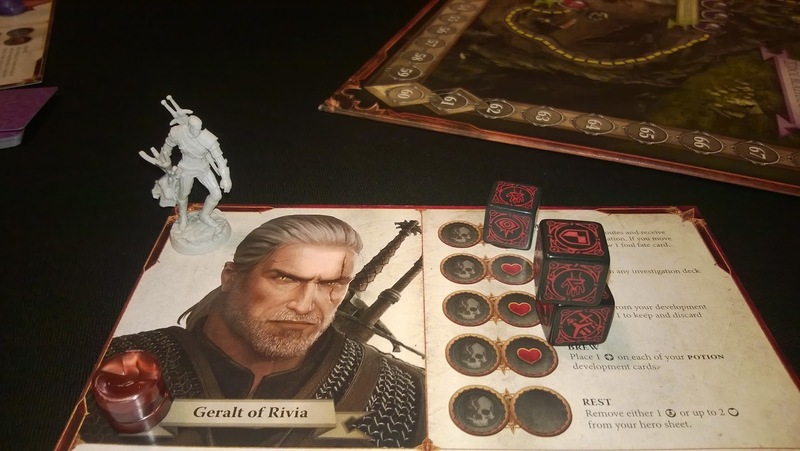 The Witcher Adventure Game is a great game and it plays well with the full set of four players, as there's plenty going on and you spend a lot of time keeping an eye on the movements of the other characters in the hope that you can benefit from them. The game is competitive but not in a 'defeat the other players!' way, and a pleasant evening of gaming can be had without trying to grind the other players into the ground. Good fun and well worthy of the Witcher franchise. Highly recommended. There are quite a few roleplaying groups out there. Which type are you most suited to? A myriad of different gaming groups has spawned a lot of different styles of gaming. You get your heroes, your wargame-types, your freeformers... each group has a different approach to how the game should be played. Roleplaying has come a long way since the days of ‘don your armour and draw your sword to kill lots of nasties and get the gold from the dungeon’ type games. Hundreds of groups all over the world have their own little quirks and house rules that make their game unique, but on the surface a lot of groups share the same traits. How do you play your games? The SOCIABLES don't take their gaming too seriously. In fact, as soon as they are distracted by anything that they think is more entertaining, they'll drop their dice and take off. Oh, they'll get together on a pre-set evening to do a game, but there's a chance that the game will fall apart half-way through the session, or maybe it won't even take off. This is because that roleplaying is just another way of getting together. Groups like this don't usually last long. Sometimes they'll have a good game where they'll get into a situation they can relate to, but those games are few and far between. WARGAMERS are almost exactly what the term means- they play the game to conduct detailed combat situations, and roleplaying pretty much takes a back seat. Their characters are two dimensional, almost always being a part of a military outfit, or at least trained that way. The term 'hack n` slash' applies to these kind of groups, who don't think they've had a decent night's game unless someone has been killed or something has been blown up. Considering a lot of games are especially created for conflict and war, these kinds of groups are quite common. The FLAMBOYANT groups are the ones that belong on the stage. Their games are more or less freeform, with the rules used only to govern confrontational situations. They'll jump from their chairs and wave their arms about to physically express their character's actions. The place they play their games will be decorated to suit the mood of the game, like having candles lying around or drapes over the windows. 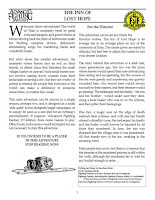 Each player is an actor in their own right, and would rather decide a situation using their skill as a thespian rather than what they have written on the character sheet. Another common kind of group is the RULESMONGERS. The rulebook is law, and deviating from that law is wrong. These gamers will quote rules for every situation, be it combat or climbing a rope or NPC interaction. 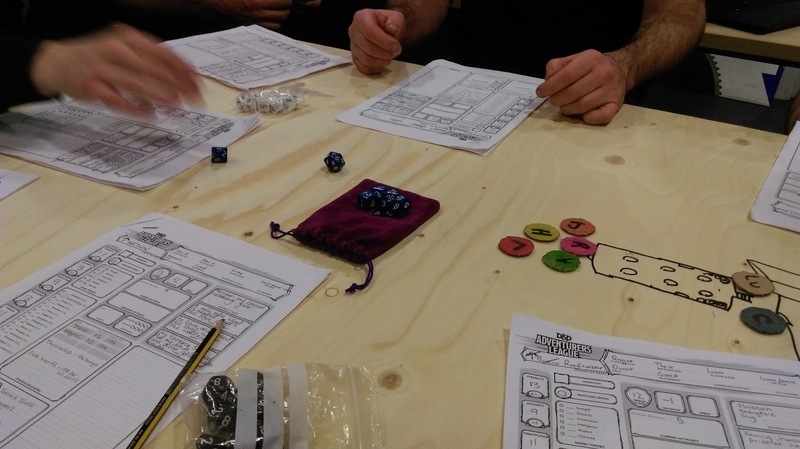 Half the evening's session will be taken up by flipping through the rulebook or companion volumes, checking charts and tables and passing books across the table. Some of it is also taken up by disagreements on a rule interpretation. The players question each GM decision and the GM checks every player action carefully. MOTIVATED roleplayers are the ones who only really want what's best for their character. They want decent equipment, better skills and a higher status. They'll play their characters to the hilt to get the most out of it, and try to reap in rewards and prestige. They'll place their character sheet and applicable notes in clear binders, and flesh out the character with complicated backgrounds and a predetermined goal. 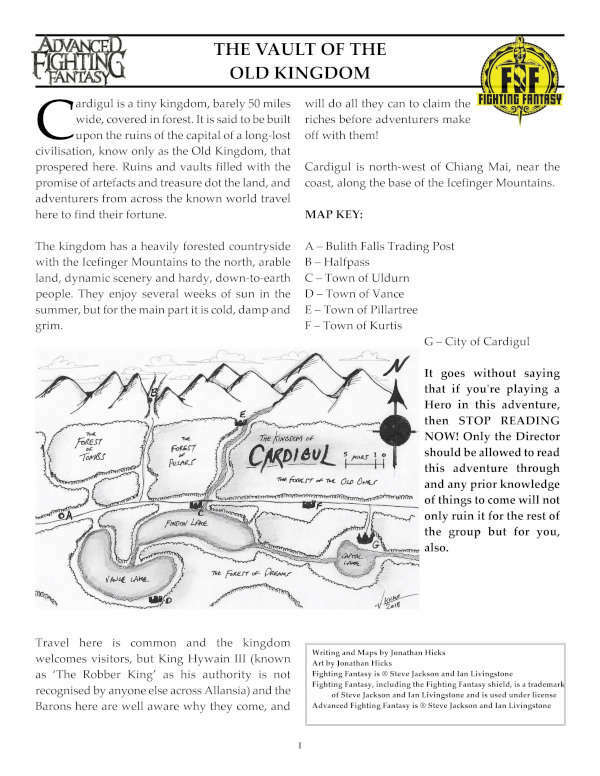 Likewise, the GM will have detailed notes on all the NPC's the PC's will meet detailed locations and maybe even draw up a sequence of events that happen around the players. These sorts of groups' spawn the STORYTELLERS, who play the game to unfold a plot that has the traditional beginning, middle and end. These groups can be quite linear with their play, with the GM guiding the players along a story already conceived. They can also be quite unpredictable, what with the players wanting their characters to do what's best for them, and the GM trying to cater for all the different PC's by introducing alternate plots. INTENSE groups are the ones who get right under the skin of their characters, giving PC's and NPC's alike psychological traits which go beyond what they have written down on their character sheet. They play characters with dark pasts or horrible phobias, and react to situations with intricately fleshed out actions. They have personal reasons (at least, personal to their character) why they are acting in a certain way. Their campaigns revolve around personal tragedy and psychological trauma, with moments of high drama and tense atmosphere thrown in. Finally, there are the CASUALS, who are willing to play the game but are indifferent to the outcome. They'll crack jokes throughout the game, make light of grave situations and generally be laid back about aspects of the session that would mean a lot to any other roleplayer. These groups tend to change GM's frequently, and PC's are quite expendable. The players will play their characters, sure, but if they died it would be no big deal. The scenarios are pretty much open, allowing the players free rein of their environment with the GM winging the games to give the players something to do. Different types of groups produce different kinds of players and GM's. Some players don't mix well, however. Could you imagine taking a rulesmonger and slapping him in the middle of a flamboyant game? It doesn't take much to realise that it would not work. A rulesmonger would probably fit in better with a group of wargamers. A motivated player would probably mix well with a group of flamboyants. 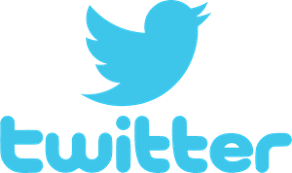 A sociable type would probably get bored very quickly with any other group. So which of these groups would you fit in well with? Perhaps you would fit in with more than one. You may be a rulesmonger who likes to be intense about the games, or you may be flamboyant gamer who has a lot of motivation for the character being portrayed. Better still, which of these groups is like your group?